Nike’s Air VaporMax lineup with be extended with a handful of new VaporMax 2019 color options scheduled to launch throughout the spring season. This upcoming release features a Grey stretch textile and synthetic TPE-infused upper highlighted with Teal accents on the Swoosh logos, taped heels, and tongues. A clear VaporMax sole unit completes the design. 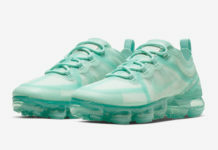 Check out the official photos below, and look for this Air VaporMax 2019 to release very soon at select retailers and Nike.com. The retail price tag is set at $190 USD.